FFA - Hair Club sponsors Al Jazeera America where CAIR challenges “no fly” list. Great News! No Fortune 1000 companies have advertised on Al Jazeera America since October 6, 2013 thanks to the people who support Florida Family Association’s email campaigns. More than two thirds of the network’s advertising time is devoted to Ad Council freebees, cable channel productions or network promotions. Hair Club has advertised on Al Jazeera America for several months. Company officials have ignored communications from the Florida Family Association office. Their company is small just like the other six companies that continue to advertise on the network. There are only seven companies advertising on channel. One Hundred Forty Five (145) companies have stopped advertising on Al Jazeera America. 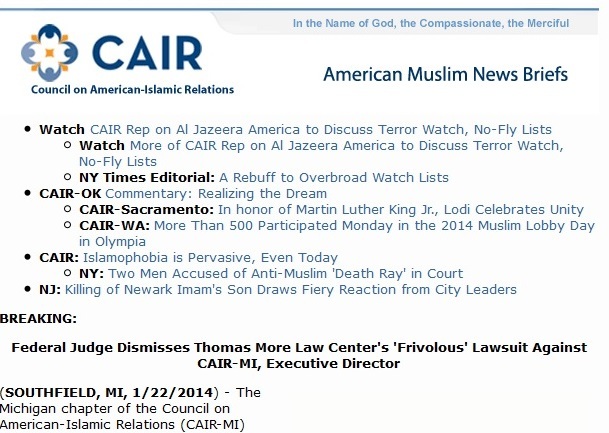 The Council on America Islamic Relations (CAIR) issued a press release on January 22, 2014 that boasted about their appearance on Al Jazeera America to speak out against "no fly" lists. Part of that press release is posted below. Hair Club certainly has the right to choose where they use their advertising dollars. You have the same right to object and choose to patronize other companies that won't give your consumer dollars to Al Jazeera. Florida Family Association has prepared an email for you to send to Hair Club officials.